Are the knees of the bald cypress anchors? Are they snorkels? Scientists still don't know for certain! 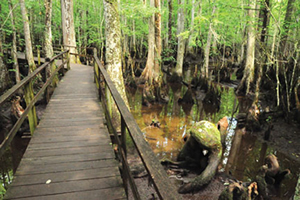 Take a walk along an elevated boardwalk over one of South Carolina's protected blackwater swamps, and it probably won't be long before you see a village of woody, cone-like forms emerging from around the fluted bases of the bald cypress trees (Taxodium distichum) that grow there. They are odd creatures, inviting curiosity and speculation. You might see many "gathered" around a tree or you may just see a few. For some folks, these knobby knees circling the bottom of the towering bald cypress trees bring to mind the "Ents," the talking trees of J.R.R. Tolkien's fantasy world of Middle Earth. But to those who study them, they are a stark reminder that we still have much to learn about swamp trees and their place in the swamp ecosystem. This much we do know: the mighty bald cypress is a time-tested feat of nature. Cypress logs recovered from quarries in the Pee Dee region of South Carolina suggest these venerable giants lived as long as 45,000 years ago. And in 1985, in the bed of Lake Phelps in North Carolina, researchers uncovered Native American artifacts that included dugout canoes made of cypress trunks, some of which were found to be more than 4,000 years old. Cypress trees were extensively logged in the early 1900s in South Carolina and throughout the southeastern United States. 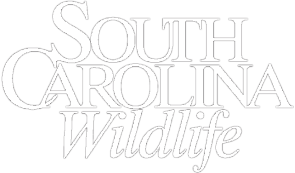 Today, large bald cypress trees can still be seen in preserved settings in locations like the Congaree National Park, Francis Beidler Forest in Berkeley County and the Webb Wildlife Center in southwest Hampton County, nestled among canopies of other storied trees like red maple, ash and tupelo. But it is the bald cypress' knees that distinguish it from its neighbors. The knees grow vertically out of the tree's roots, and loop out of and back into the soil to form woody, knobby protrusions as the tree grows. Generally found at the foot of the bald cypress, the knees themselves can grow fairly high. The Webb Wildlife Center boasts cypress knees that are more than eight feet tall, according to wildlife biologist Jay Cantrell. "They are all in one area along Tison Creek, just below Bluff Lake," says Cantrell. 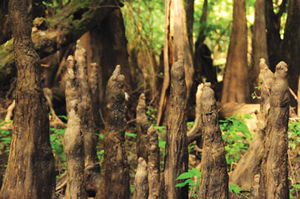 In 1803, the early American surveyor Andrew Ellicott observed bald cypress knees as high as ten feet; other researchers have recorded a fourteen-foot-high knee along the Suwannee River, which flows through Florida and Georgia. Mark Musselman, education director at the Audubon Center at Beidler Forest, says that factors such as water flow might contribute to the size of the knees. "You get bigger knees where there's deeper water," he said, "and the older the trees, the more knees, generally, since there are more roots growing out." But, he cautions, it would be difficult to place which knees belong to which trees "unless you dug them up and actually traced the root back to the tree." 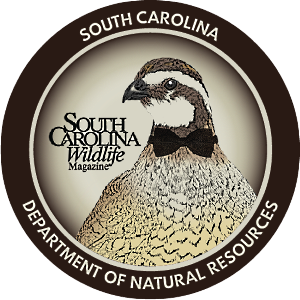 For certain, there is a notable change in knee size from an area such as the Congaree National Park, which gets much of its water from the Congaree River, and Beidler Forest, which is dependent on rain water to fill the swamps. 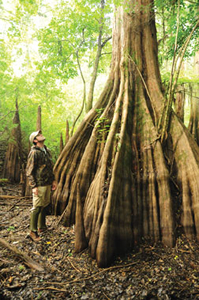 Not only are the Congaree cypress trees bigger, the knees are noticeably thicker, too. At Beidler, the knees are still hardy, prominent stumps, but visibly thinner. "The water we get is just from rain, and you only see water in the channels in the lowest part of the swamps," says Musselman. But what function do the cypress knees actually serve, and what do we know about them? Researchers have been exploring that question for years. One hypothesis is that knees penetrate out of the water in order to bring air or oxygen to the roots of the trees. The thought was that the knees might act as pneumatophores, or breathing roots, like the roots of black mangrove and other swamp trees. In 1890, naturalist Robert Lamborn suggested testing this theory. But it wasn't until 1952 that Duke University researcher Paul J. Kramer and his colleagues examined this idea, enclosing knees in airtight containers and measuring the oxygen consumed. They found, however, that the knees' rate of oxygen consumption was actually lower than that of other plants, leading them to conclude that "cypress knees play no important role as aerating organs." Another theory is that knees serve as an anchor to support the weight of the tree, with their horizontal networks creating a formidable buttress against strong winds. This was what Lamborn first proposed, along with his contemporary, U.S. Forest Service scientist Wilbur R. Mattoon, who suggested that the knees were involved in "enlarging and strengthening the basal support" of the tree's root system. However, it was found that in some trees growing in deeper water there was an absence of knees on the roots entirely, which seems to cast doubt on that theory. On the other hand, it's also possible that this absence may be due to the fact that in deep water, the knees may still be present and providing the important function of "pinning" the horizontal roots together below the surface. In 1992, researcher William M. Pulliam suggested that knees might give off methane emissions through the soil around them. But when Pulliam measured the emissions of methane from cypress trees in Georgia's Ogeechee River swamps, he found that the knees accounted for less than 1 percent of this type of "swamp gas." Others noted that the methane could have even possibly been a byproduct of the bacteria found outside of the knees - strike three. Still another hypothesis suggested that knees attract and provide nutrients to the tree. In 1933, Zurich scientist Hans Kummer and colleagues studied a group of cypress trees in a shallow depression in Florida, where the tallest trees were found to be at the center and the shorter trees at the edge. They soon found, though, that the greatest number of looping roots were actually located near the dead stumps on the outer edges, rather than the live trees in the center. All the scientific theories to this day remain just that, says Musselman. But, he adds, even if there is no answer regarding the function of the knees, it's clear that they offer some benefits, particularly in providing a hedge against violent storm damage. Indeed, the vertical knees may act as pins, giving strength to the horizontal roots by holding them together and preventing blowdowns during high winds. "If you could scrape away all the soil," Musselman says, "you would see the roots from all the different trees growing horizontally together. You have the vertical knees growing through all of that, and you have an incredible network of roots that make it difficult [for strong winds] to uproot. Whether or not that is the original reason the cypress knees evolved is debatable, but that seems to be a major benefit." 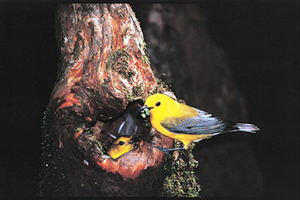 The open cavities of cypress knees also serve as nesting areas for the prothonotary warbler, a bird species for which Audubon Society officials are working hard to restore natural breeding habitats. There may never be a definitive answer to the role and function of bald cypress knees, according to Fran Rametta, who retired in September 2010 after serving more than 30 years as a park ranger and naturalist at Congaree National Park. 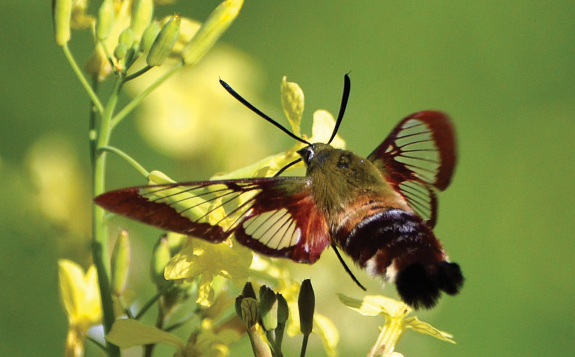 "We touch, hear and see only a tiny part of the great mystery that lies beyond our senses," says Rametta. And it may be that the mystery of the true evolutionary function of cypress knees is one that will never be solved, but without question, they will continue to amaze and delight visitors to these wonderful natural areas in South Carolina. 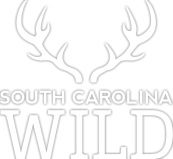 This is Columbia-based freelance writer Lisa Lopez Snyder's first feature story for South Carolina Wildlife.